I once wrote that “vintage Halston” may be my most favorite combination of words ever. If you don’t believe me then check this out. Now don’t you feel silly for doubting my veracity? Well, I’m in a very forgiving mood today so I won’t let this temporary lapse of judgment mar my opinion of you. 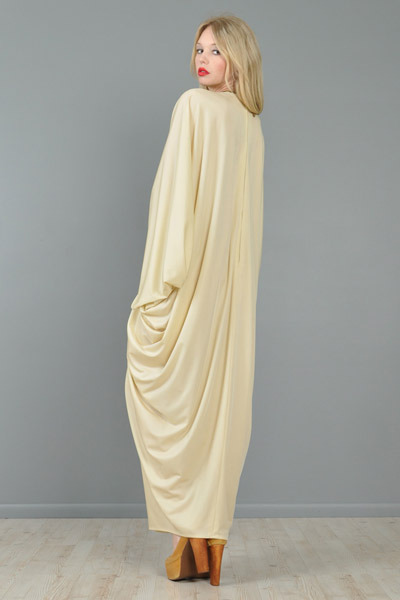 Back to this week’s look, below is an impeccable example of vintage Halston, a flawless, draped, one-shoulder goddess dress from the 1970s. Currently for sale on eBay and the seller is accepting offers. Click on the images below to see the actual listing.